Toshiba America Medical Systems unveiled a new high-field 3T MRI that promises to provide new possibilities for routine and advanced imaging across a range of applications—neuro, MSK, abdominal, cardiovascular, breast and prostate—with a heightened focus on patient comfort. The new Vantage Galan 3T is a premium MR solution designed to increase signal-to-noise ratio (SNR) by up to 20 percent, allowing for faster sampling and higher resolution images thanks to PURERF and Saturn technologies. This, combined with the ability to stack protocol sequences, results in quick neuro exams. Initial indications suggest the following neuro sequences can be performed in under five minutes: SAG T1, AX T2, AX T2 FLAIR, AX T2* and AX DWI/ADC. Additionally, the system enhances diagnostic confidence with new advanced clinical applications and helps make exams easy to perform with EasyTech workflow solutions, which streamlines positioning and scanning. 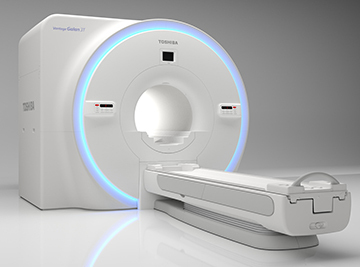 “The introduction of the Vantage Galan 3T represents a major breakthrough in the clinical applications of 3T imaging,” said Dominic Smith, senior director, CT, PET/CT, and MR Business Units, Toshiba America Medical Systems, Inc. According to the company, the system prioritizes patient comfort by making scanning even more quiet with Pianissimo™ Zen technology that reduces sound during acquisition by 99% as measured by unit of Loudness level “dB” and 97% reduction by unit of perceived loudness “Sone.” The Vantage Galan 3T expands access to bariatric and claustrophobic patients with its 71 cm patient aperture. Additionally, the system’s eco design reduces energy costs and makes the system easy to install. For more information, visit www.medical.toshiba.com. Toshiba Launches 3.0T MRI Designed to Shorten Exams and Improve Image Quality. Appl Radiol.